It’s the start of summer, and thoughts turn to Burning Man and the high, dry desert of Nevada. To kick off the season, American Steel is hosting Burning Man’s Precompression party this Saturday, 6/20. American Steel is our home, so we don’t have to travel far for this one! We’ll be hanging out all evening with the Cloud, illuminating the party from a bridge crane. Come find us. We’d love to show off the cloud and tell you about our new project, Straightedge: a 2.7 mile long straightedge that shows you the curvature of the Earth. You can find out more on our Kickstarter page. The Ardent Mobile Cloud Platform hits the museum party circuit! Join the Ardent Mobile Cloud Platform at the Academy of Art Nightlight event presented by CODAME ART+TECH in support of the Adopt an Artist program. Thursday evening, August 7th, from 6-10pm (21+ only). 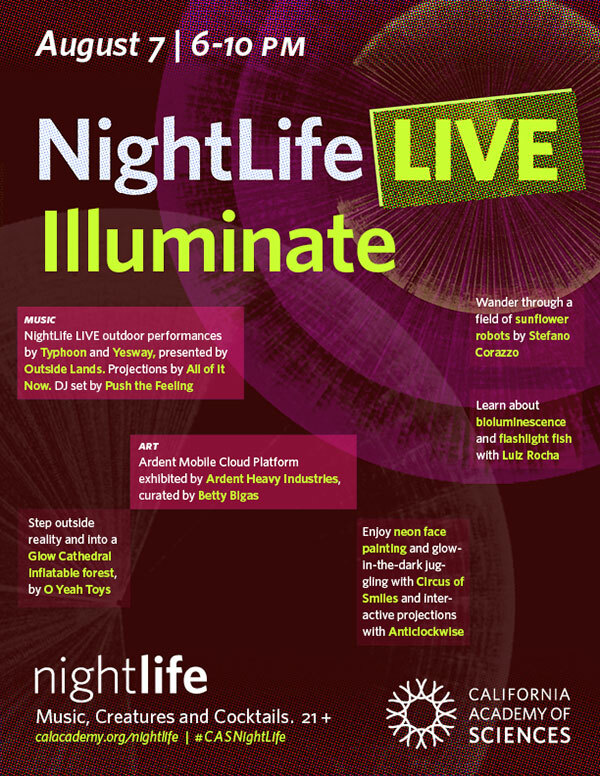 This week is Nightlife LIVE: Illuminate, featuring musicians from Outside Lands and light art including an inflatable glowing forest and our very own Cloud. Play conductor as you take control of the Cloud’s cutting-edge LED and sound effects, creating an orchestra of sunsets, lightning storms, and thunder with the touch of a button. We’re excited to announce that aerialist Lyra Levin will give an exciting aerial performance suspended from the Cloud. Along with her aerial artistry, Lyra was one of the main engineers of the Cloud itself. For more information, visit the Cal Academy’s event page or view the Facebook event invitation. Thanks to our friends at CODAME for partnering with us to make this appearance happen, and to the California Academy of Sciences for hosting. 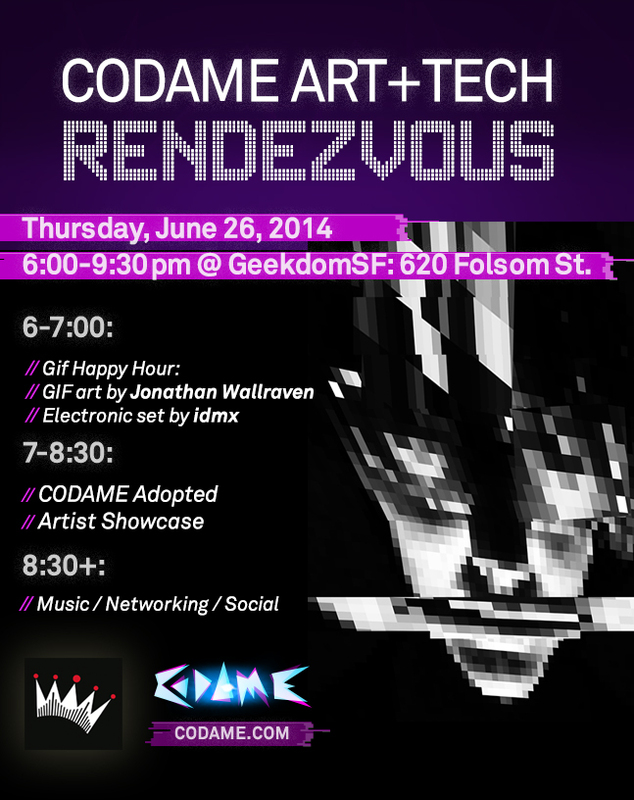 This Thursday, June 26th, join us at CODAME and hear from Ian Baker about building the Ardent Mobile Cloud Platform. Several other Ardent Heavy Industries members will also be around after the talk to answer questions and share stories of sending people high into the sky at Burning Man. Want to chat about LEDs specifically? Micah Elizabeth Scott, the mastermind behind much of the Cloud’s LED technology will also be there talking about her new piece, Ecstatic Epiphany. Tickets are donation based with a suggest $10-20 range. You can get them at the Eventbrite page.